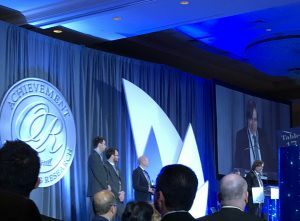 The prestigious Franz Edelman Award for Achievement in Operations Research and the Management Sciences was presented at the Edelman Gala on April 16th, 2018 in Baltimore, Maryland. The Franz Edelman competition honors distinction in the practice of Operations Research and Analytics, by both individuals and companies, with emphasis on the beneficial impact of their achievements. To reach the finals, companies are required to demonstrate how their use of technology is transforming the approach to some of the world’s most complex problems. Simio is proud to be the provider of the simulation that facilitated one of this year’s finalists, Europcar, through our partner, ACT Operations Research (ACTOR). Our combined technologies have been used to develop Opticar which provides forecasting, simulation and optimization of the processes relating to vehicle rental for the leading European car rental company. The vehicle rental industry is a huge, complex, constantly changing market, with cultural variations across countries. In order to meet dynamic demand, decisions are continuously made regarding fleet assets, their locations, usage and pricing. The combination of AI, statistical modeling and simulation allows all eventualities to be considered and evaluated in order to establish optimum processes and make informed decisions. Simulation can be used to model the possibilities with respect to both capacity and revenue, helping managers of car rental companies to reduce their risks in terms of planning for optimal fleet saturation. By making quality decisions, they can constantly maximize business opportunity for the company and ensure consistent financial and service performances. At Simio, we are constantly solving business problems of this kind through simulation. When complex system schedules and decisions are required, we deliver leading edge solutions across many industries, from manufacturing to transportation and logistics. Simio is proud to congratulate our partner ACTOR, with Europcar, on their outstanding achievement of becoming a Franz Edelman Award finalist. As we experience this exciting time in history, the 4th Industrial Revolution is happening all around us, without most people even knowing about it. Massive leaps forward are being made possible by the digital platform that the whole world is adopting. But how did we get so far in the relatively short time of 200 years – in the span of a few generations? It was only in the final years of the 18th century that the 1st Industrial Revolution began when steam power changed how things were made and transported. The invention and refinement of the steam engine and the use of hydraulic power enabled the economy to develop, and allowed people to move forward and experience growth and travel. 100 years later, in the 2nd Industrial Revolution, electricity facilitated assembly lines and mass production, sparking the consumer age and creating further opportunity for innovation and discovery. The momentum continued when, at the beginning of the 1960s and throughout the 3rd Industrial Revolution, computing allowed machines and networks to spread to homes, schools, universities and workplaces, developing the potential for study and the exchange of ideas, promoting further advancement. Each subsequent decade brought significant progress; semiconductors and mainframe computers in the 1960s, personal computers in the 1970s and 1980s and the internet in the 1990s. The 4th Industrial Revolution, or Industry 4.0, is upon us in this 21st century as we build even further on that foundation, with the potential to achieve exponential growth in what we are able to attain. Reaching across disciplines, we are now transferring technology between the physical, digital and biological domains. Change is happening faster and new developments are spreading more quickly than ever. Cyber-physical systems are melding the physical and virtual worlds, using simulation and virtual reality and even creating Digital Twins. All of this allows us to study and understand the world we are creating, speed up the design process and predict behavior, in order to boost productivity and prevent disaster. The perfect tool for the Smart Factory, Simio Simulation Software helps capitalize on the Industrial Revolution that is happening around us; improving agility, increasing productivity and mitigating risk as the next stages in the process of disruptive change unfold in our exciting new digital age.